Now at shopdrops.com's Pet Section - Haute Couture for fashion puppies by puppy fashion designers who love pets! You and your pets will enjoy the adorable and whimsical designer clothes for both girl and puppies! 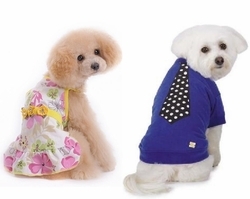 Your pets will look cute and groomed in these colorful outfits for all kinds of occasions. Choose from a wide array of casual, sporty and party clothes designed for your special pets. This adorable Pink Polka Dot and Lace Dog Dress features polka dots on the layered skirt and is fully lined. It is belted with a large white bow. INCLUDES a Matching Fabric Leash. A Polo Shirt is a staple items for your dog's wardrobe! On any occasion, you really can't go wrong with a polo shirt for dogs! Made of 65% Polyester, 35% Cotton. Machine wash in cold water on gentle cycle. Pups can find comfort no matter where they are in this Casual Canine® Hawaiian Breeze Camp Shirt. A great dog apparel choice for walks on the beach, in dog parks, or out on neighborhood jaunts. Adding to the cuteness is the perky red and white polka dot print that is accented with a double ribbon trim at the waist and overskirt. The tulle underskirt is trimmed with more polka dot fabric for an adorable confection that will have your party girl's fans raving! Dogs will have an Owl of a good time in the hoodie. The Zack & Zoey® Hoot and Howl Dog Pullover features cute details on the hood and pocket and a screen printed owl on the back. Ships ahoy for your little sailor gal in this stunning and striped Nautical Dog Dress with Matching Leash! Scattered anchored skirt design won't hold down the dreams of far off lands in this festive dress. A fashion staple for any stylish pup, our Zack & Zoey Basic Dog T-shirt can be worn any time of year and with any look. Each lightweight, comfortable tee has elasticized neck, sleeves, and hem. Romance is in the air with this Wisteria Floral Dog Dress by Doggie Design! Features lavender floral pattern with Lavender bow at the waist. Dogs can celebrate sun, surf, and sand in the beach-themed design of this screen-printed Casual Canine® Life's a Dog Beach Tee. Made of 65% Polyester, 35% Cotton. The back has a name tag style design that reads, "Hello My Name is Trouble." Easy pullover style and lightweight, comfortable fabric. Poly/cotton blend. Machine wash. The perfect comfortable t-shirt for your adorable furry friends who may not be the best at listening... but we love them anyway! This t-shirt is black with red around the collar and sleeves with the words "You're not the boss of me," in bold red and white text.